An autumnal outfit this, commissioned a little too late in the summer and then delayed by various factors so that it was ready just before Christmas. Still, on a clear winter’s day with an overcoat it serves very well and it will also do well into the Spring. The brown cashmere jacket from the Harrison’s Moonbeam bunch is about the only weight of jacket I wear outside of summer cottons and linens, and the odd heavy tweed. For when you work in the same air-conditioned office year round, outside temperature is less of a consideration. Or at least it is if you are determined to wear your jacket at your desk. The tailor at Graham Browne did a special job with the inside of this jacket, extending the facing around onto the inside of the forepart and leaving the lining to run just around the inbreast pockets and across the back. This design, similar to that on my Rubinacci jacket, was an experiment for a traditionally English tailor but came off rather well. I’ll do more detailed photos of that at a later stage. The trousers are a cotton gabardine but in retrospect I should have opted for wool gabardine. 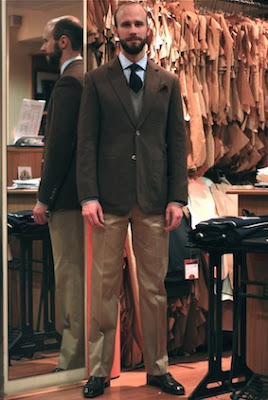 While cotton is great for a slouchy summer suit (as seen here, also by Graham Browne), in trousers alone its weaknesses in drape and sheen are exposed. This is no one’s fault but my own. It will quickly be corrected, however, with some cream trousers being made for summer. Grey sweater by Loro Piana, brown lace-ups by Cleverley, navy grenadine tie and wool/silk handkerchief by Drake’s. You can follow the discussion on Graham Browne: Brown cashmere and tan cotton by entering your email address in the box below. You will then receive an email every time a new comment is added. These will also contain a link to a page where you can stop the alerts, and remove all of your related data from the site. As always a great cut jacket by Russel (I assume). Are you still also having suits made by GB or have you shifted completely over to Savile Row for that? This coat seems a bit short. Is this the usual length of your coats? Very nice Simon. I’m looking forward to those pictures of the interior of the jacket. Very nicely executed, and you look excellent, but I have one question: why brown? I just cannot see the appeal of that colour. For my taste, the jacket looks a little short, and the button stance looks a touch high. Is this what you asked Russel for? Why brown? Michael Alden addressed that very point recently http://vimeo.com/34657736. Cities are usually made up of grey, black and blue shades, which I guess is why Carlo Brandelli used to produce clothes in those colours at Kilgour. The idea is to blend with one’s surroundings. Brown doesn’t work – just like wearing a navy pinstripe in the countryside doesn’t work. You’re right, that is a good rule of thumb. Like most rules I’d consider it for the guidance of wise men and the blind obedience of… less wise men. Now that the subject has reverted back to Graham Browne for a post, I thought I would raise a question I have regarding your blue, DB, Graham Browne suit. Particularly the look you created at that wedding last year (the photo where you are standing with your daughter). The reason I ask is that my wedding is coming up in May and I am in the process of getting a shirt and suit made, alas my budget does not stretch to bespoke, so I am going made-to-measure. Anyway, my aim is to replicate your look for my wedding; however, whenever I look at photographs of double breasted suits, the buttons seem close together and do not give the same look as yours does. Was the button layout something you discussed with Russell at Graham Browne or is that their style? Furthermore, as I am getting the suit made-to-measure, do you think it is possible for me to achieve the same look with the buttons as the possibilities in made-to-measure are greatly reduced compared to bespoke? I’m flattered you are taking inspiration from my look. The answer is no, the button placing was not something we specifically discussed. It may just be that most modern MTM suits and RTW put the buttons closer together so there is a longer roll to the lapel, which could be more slimming and contemporary. I don’t have much experience with MTM, but my expectation is that you will find it hard to get as good a fit with DB, which is that much harder to fit. Then again, Graham Browne isn’t much more expensive than most MTM! No, I know. Graham Browne are very good value for money, I did go in a couple of times to enquire. However, my usual tailor is based in Hong Kong and coupled with the fact we blew a lot of the budget on the honeymoon, it was not possible for me to stretch that far, so had to settle for something else. Anyway, you’re right regarding the fit of a DB in MTM but I’ve found a place in Fulham where the owner used to be a cutter at 40 Savile Row and because he cuts the suits himself, I’m hoping he’ll be able to get my suit somewhere near the look of yours. Also, thought you might like to know. I’ll be wearing dark brown shoes, not black ones!